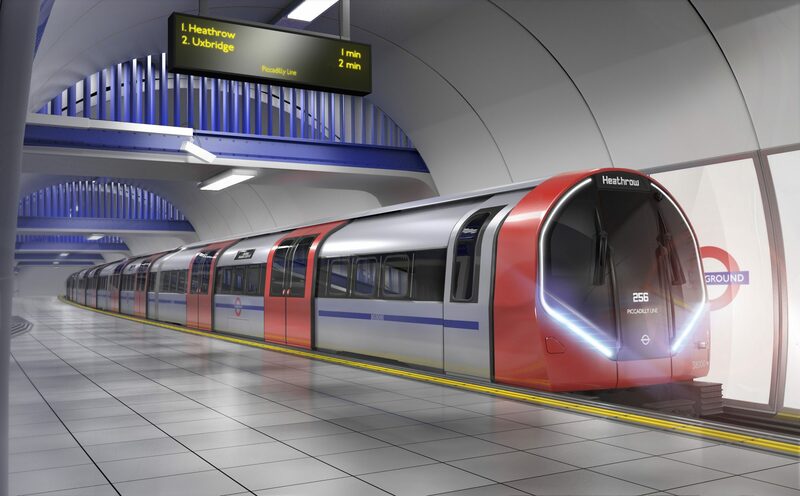 Siemens has been named by Transport for London (TfL) as the chosen supplier for the £1.5 billion Deep Tube rolling stock contract. The 94 new trains, which will serve the Piccadilly line, will be built at a new factory in Goole, East Yorkshire. It is the first order to be placed under the Deep Tube Upgrade Programme, which will introduce brand new trains across the Piccadilly, Bakerloo, Central and Waterloo & City lines. Although it is only the first order to be placed, TfL said it was placed based on the expectation that a single supplier will manufacture all of the new Deep Tube trains. Announcing the contract award, TfL said 22 UK suppliers were identified in Siemens’ bid to deliver the new fleet. The Inspiro trains will replace the Piccadilly line’s 1973 stock from 2023. As well as introducing new trains on the route, TfL is upgrading the signalling and control systems across the Deep Tube network. By the end of 2026, 27 trains per hour (tph) will run at peak times on the line compared to 24 tph today. Mike Brown MVO, commissioner of TfL, said: “Today’s announcement of our intention to award the contract to design and build a new generation Tube train is a huge milestone for London Underground. “We are delivering the biggest investment programme in our history to continue to improve customers’ journeys and support London’s population and employment growth. It also demonstrates once again that investment in London creates jobs and apprenticeship opportunities right across the country. Sabrina Soussan, CEO Siemens Mobility, added: “We are thrilled by today’s announcement. Our metro trains travel the equivalent of 60 times around the world each week, transporting millions of passengers comfortably and efficiently. The 1973 stock, along with the original Victoria line stock, were some of the most elegant looking underground trains ever built. Finally the new deep level tube trains order finalised. Now Siemens will build the fleet. At least the design is not that weird round front mock up. There will soon be four trainbuilding plants in tbe country, plus Alstom who are talking about adding a new train assembly plant to their Widnes facility and even TALGO looking to open a factory. Whilst Siemens are, probably, the most experienced of the bunch, they could have problems if future orders from TOCs and London Underground begin to slow down – particularly with the growing competition from other UK-based builders. The Bakerloo Line also needs new tube stocks to replace the 1972 Tube Stock. As the Piccadilly Line is to receive the new tube stocks that will replace the 1973 tube stocks from 2022/23. Aswell new tube stocks to be ordered for the Central Line and Waterloo & City Line to replace the 1992 tube stocks.